Handmade Door Draft Stopper is a double sided insulating device for doors AND windows! The draft stopper works on any floor, to insulate living areas, garages and basements. It is easy to install and is made from washable. ❤PREMIUM MATERIAL: 100% polyester made cover which is soft touching and durable. Exquisite workmanship with double sewing thread, durable and long life used. 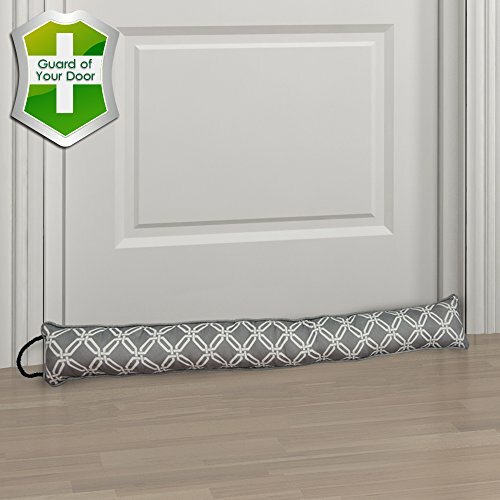 ❤GREAT DOOR GUARD AND PROTECTOR: Our energy saving draft stopper will block the hot wind in the summer (or cold wind in the winter) from entering your room, absorb dripping water and sweep the dust under the door threshold. Also great for blocking noise, odor, fumes and all kinds of small insects (such as Mosquitoes, Flies, Cockroaches, Ants). ❤SUITABLE FOR ANY DOOR: Size - 36"l x 4.25"w x 2.5"d, Weight is between 1.65 to 1.76 Lbs. Fits doors up to 36 inches. Perfect for blocking extra-large gaps under your door. Can be used for your front door, back door, garage entry door, bedroom door, bathroom door, etc..
❤EASY TO STORE: Design with a hanging loop. You can hang it on the door handle, closet hook or other out-of-the-way space. ❤MONEY BACK GUARANTEE: We think you're going to love this draft stopper as much as we do. But in case you don't, just return it within 30 days for a full refund, no questions asked. We want our customers to be 100% happy. If you have any questions about this product by Gravan, contact us by completing and submitting the form below. If you are looking for a specif part number, please include it with your message.